I have been a bit slack with the posts recently, no real reason, just busy doing other stuff, you know how it is. 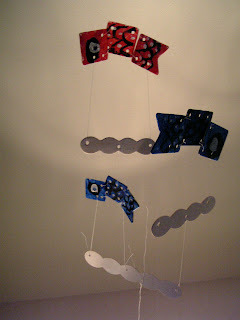 We painted and made a koinoburi (boys day carp) mobile which was a lot of fun until I had to string the thing together, turned out to be a royal pain in the **** I gave up with the nylon thread that was supplied with it and used cotton instead, needless to say it is completely wonky! We had another food tasting exercise which was a lot of fun. This time I put out 12 samples but kept them hidden from babyebi then made him close his eyes to try each sample, he then had to describe the foods, it's crunchy, soft, sticky, salty, sour etc. He didn't have to tell me what he thought it was. The 2nd round I got him to guess what he thought the food was and had picture cards for him to match the food with. The only one he got wrong was the strawberry, he was convinced it was tomato. 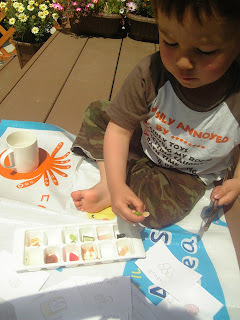 The final part was combining the foods, first with his eyes closed, I would combine two things and he had to decide what they were then he decided he wanted to try combining the foods some were predictably revolting like strawberry and nori but some were quite nice such as cucumber and yuzu jam! I would like to expand on this at some point and experiment of which foods when combined taste like something else. For example my husband swears that avocado and soy sauce together tastes just like tuna sashimi there must be more odd combo's like this. 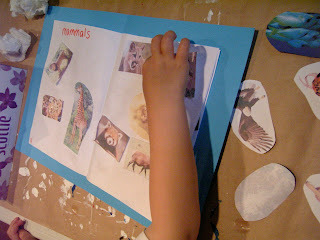 Yesterday, on the way home from the shops he decided he wanted to make an animal book but it had to include dinosaurs too. So while he took his nap I prepared the 'book' basically folding some A4 sheets in half and using a B4 piece of card as the cover and sewed down the spine. As we don't really buy magazines I hadn't got any pictures for him to stick into the book so I got on the Mac and went to my best mate google found some pictures to print off. I managed to do mammals, dinosaurs, birds, fish and insects before he woke up. He sat for well over an hour sorting the pictures into the correct category and sticking them into his book, we will probably add reptiles and amphibians today. 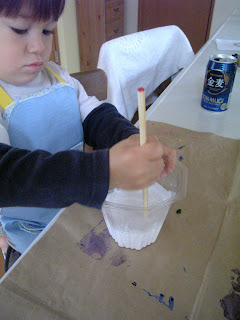 We also tried our hands at making plaster molds this week. 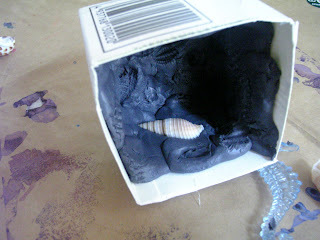 We put clay inside the bottom of a milk carton them pushed various shells into the clay to make an imprint. tapped the sides to get the air bubbles out and let it dry. 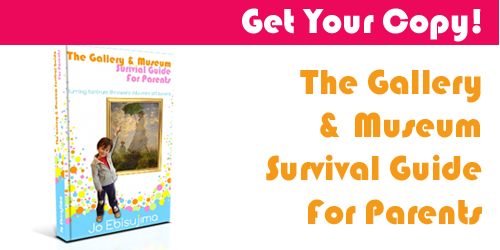 This wasn't the most best project we have done. 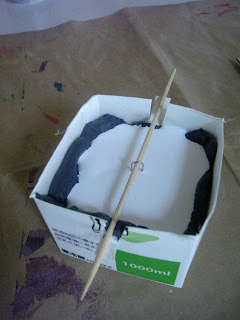 I think I got the quantities for the plaster a bit out as the final cast was very crumbly - sorry didn't take a picture. BabyEbi couldn't push the shells into the clay very well either so he soon got bored, he did like mixing the plaster though. I think next time I will try something a bit easier like this. 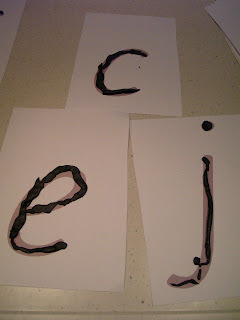 BabyEbi is very much into writing his name at the moment and trying to write other letters too. We have the sandpaper letters but he really has NO interest in them so I thought I would try this idea sine he loves playdoh, he did a few letters, shaping them out first them making the letter with playdoh, he can't make 'sausages' very well so he soon got fed up with it all, I doubt he will ask to do it again. 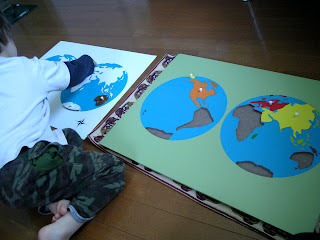 He is very much into puzzles at the moment and is learning the names of the continents, I also found a couple of great puzzles in the ¥100 store, 2 for ¥100 yen and they have famous monuments around the world on them, I will be thinking up some extension activity to go with them. 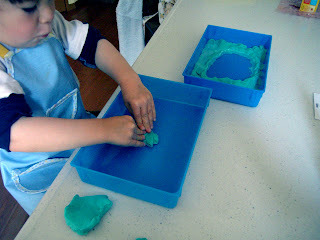 We also started on the land and water forms, I decided not to make the forms myself but instead give him oil based clay so that he could make them himself. He has on the shelf, the clay, 2 plastic blue trays (quite deep) a jug of water and the form cards. We started off with a lake and island, I underestimated the amount of clay needed so the lake ended up being quite big and the island quite small! But he enjoyed the work so I am sure we will work on the other forms in the same way. BabyEbi is so lucky, both to have such a great mom who likes to explore and learn with him and to get the exposure to two different cultures. Sometimes I am jealous. I am sure he will grow up to be an amazing person. 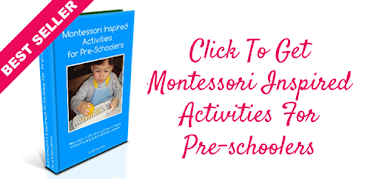 I love that book idea - I am sure my 3yo would love that - his would haev to have dinosuars too!! I like the idea of the letter cards and the sausages of modelling clay. That's an idea that would work very well maybe a year from now when his motor skills are a bit more refined - I might snitch it for some of my yochien classes!